The Jungle Bunch all started with a 1 minute episode made in house by creator / producer TAT productions in the south of France. Today, the adventure of the tiger-penguin has grown into a juggernaut. 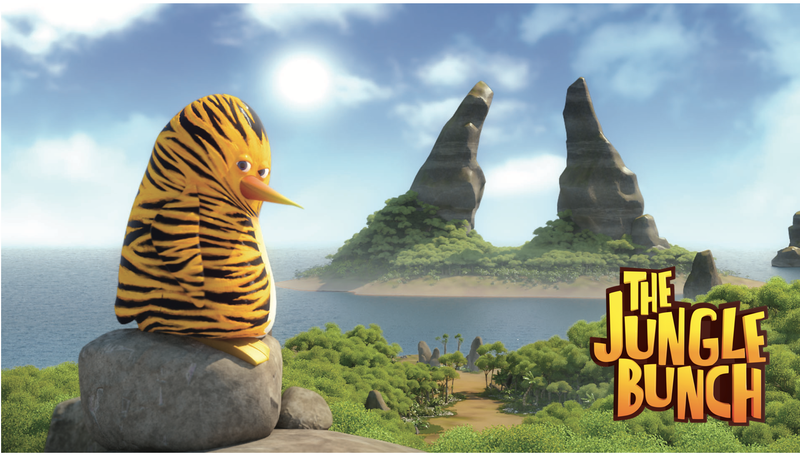 With 2 seasons airing worldwide on all continents, a robust licensing plan, a movie to be released from Summer 2017, and a third season on its way, it looks like there is no time to rest for our favorite tiger penguin! We spoke with Jean Francois Tosti, creator and producer of the show, on how they are keeping the franchise alive and their plans for the future. We wanted to develop a universe around a group of animals in the jungle, and, since we love penguins, we wanted one as the leader. But how to stage a penguin right in the middle of the jungle? … Well, what if his egg had drifted from the icefield to a beach full of coconuts? What if it had hatched just in front of a tigress? What if she had adopted him and raised him like a real tiger? Here you go: Maurice, the Great Tiger Fighter was born! The first TV special built around him had to tell the creation of his own justice league, the Jungle Bunch! Once established, this kind of A-Team was able to blossom and solve a large number of missions during the 104 episodes of the 2 first seasons of the series. What do you think makes The Jungle Bunch so special? I think the most important is its hero’s personality: Maurice is a penguin convinced of being a tiger. It’s not as if he wanted to be a tiger: he truly believes he’s one. And that’s how all the animals that meet him see him, including penguins. This gap naturally and immediately brings the universe to something unprecedented. To go further, Maurice himself has adopted a tiger fish that he raises like a tiger and that everyone sees as such. The other members of the team are not left out and also appeal to the audience, Miguel the gorilla being probably the children’s favorite. The second important thing is to be linked with the writing of the series: it’s really aimed at a family audience and this target is very wide. All the siblings, along with their parents, can watch the Jungle Bunch together and enjoy their adventures. That’s due to the fact that we’ve always wanted to make TV series « as if it was cinema », hence the many reading levels. We polished the technical and artistic sides of the show in the same mindset: we wanted to bring a « cinematographic » level of demand to it, reaching an image and sound quality unprecedented on TV. I think that’s why the Jungle Bunch, among the incredibly packed and codified universe of properties portraying « talking animals », is instantly identified by the audience as well as the buyers from all around the world. How do you keep the brand fresh with new season, new movies? I think it’s linked to the love we have for our characters and their universe. Our will to see them respond to new challenges, meet new faces, explore new territories led us to increase the number of secondary characters, sceneries, story types and character backgrounds, thus giving the feeling that each episode, each story, is unique. The series across the world gave us the possibility to bring this universe to the movie theatres, bringing the brand to another dimension. Writing the script of the movie allowed us to introduce new major characters, including the mother of our hero Maurice, thus exploring his character further. While we were looking into the personality of the Jungle Bunch leader for the movie we felt the desire to develop quickly a 3rd season for the series. That’s how, brick by brick, we are extending and completing the Jungle Bunch universe, and we’re excited to see that. Can you tell us more about what will happen in Season 3? Maurice, the Great Tiger Fighter, and his mum Natacha, a former upholder of the law herself, have made up. The tigress has moved close to the Jungle Bunch lair in order to spend some quality time with her son and grandson. Gilbert the tarsier and Batricia the bat have declared their love to one another but decide to keep it « discreet », convinced that no one knows. Al and Bob, guardians of the pond, tease each other more than ever… The Jungle Bunch is back in a 3rd season that will focus even more on the characters in a definite comedy/sitcom atmosphere, without leaving action and adventure behind, in a wide variety of missions to fulfill. In these new adventures, we’ll find out more about Maurice’s childhood, we’ll frequently bump into Jungle Bunch’s close friends and we’ll meet again all the most memorable secondary characters from seasons 1 & 2. What will be the main assets of this new season? In this new season, we’ll meet Maurice’s mother – yes: the one and only mother of the Great Tiger Fighter, but also his uncle Tony, the sloth Kung Fu master, and Goliath, the strong rhino. These characters introduced in the theatrical movie will widen the Jungle Bunch universe, building up their leader’s past, and will let the main characters come back to the heart of the series. We’ll learn more about each member of the bunch in new episodes that focus more on humor: through the relationship between Maurice and his mother, the romance between Gilbert and Batricia, sitcom situations, more ‘splastick’ jokes and the come-back of the most memorable secondary characters such as Ernest the goofball kiwi, Roger the debonair bowerbird or Patrick the jokey olm who have great comic potential. While keeping its gimmick, its missions, its action sequences, its multiples sceneries and its great technical quality, the series will therefore firmly turn to comedy, which will make the characters even more endearing. How big is The Jungle Bunch today? The Jungle Bunch airs on all continents and is on major networks like Cartoon Network, SVOD platforms as Netflix and leading free to air broadcasts such as France TV, Rai, Super RTL, Clan, ABC, TV Quebec and many more! We have also had great success in DVDs with Universal and today we are expanding on iTunes, Youtube etc… so we are very much in all territories and all platforms which is great. Building a brand takes time and we are so excited that the Licensing is expanding. We now have over 100 partners creating products from toys, puzzles, books, apparel, and even tooth brushes! It’s so great for us to see our universe expanding that way. It’s simply a kid’s dream for all of us. What are the plans for the future: live shows, more movies, more seasons? The Jungle Bunch theatrical movie will be released in around 50 countries throughout the world. If it meets as much success as we hope, we’ll quickly start working on a second movie that will follow the 3rd season, and then, why not, a 4th season to go after the 2nd movie! The Jungle Bunch will continue their adventures on small and big screens for a couple of years and we’re convinced that with the work of PGS Entertainment, that manages our universe’s licensing rights, they will express themselves through many other ways, as it’s already the case in Italy. Of course we dream of seeing them be part of amusement parks or taking the stage for musical shows!